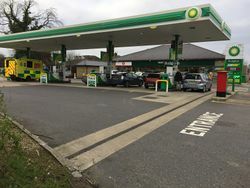 A Budgens store within a petrol station. Budgens is a convenience store chain owned by Booker, who also own Londis and Premier. They are very similar to Londis but usually have much bigger supermarket-style stores. They recently teamed up with MFG to roll out across many of their filling stations. Budgens was briefly introduced to Blackburn with Darwen in 2016 in a space that was formerly occupied by Co-op Food, however this closed with immediate effect in 2017.